Raphaella reveals an unknown, valuable and everlasting repertoire. "Born in Villacarillo, Spain, and blind from the age of 13 months, Manjon decided early on to become a musician. At 14 he left Spain to study in Paris - alone, impoverished, and speaking no French. Within nine years he established himself as a virtuoso on the 11-string guitar, touring throughout Europe and South America. He also taught himself French, German, Italian and English, and astonished everyone with his deep knowledge of literature and music. In 1893 he settled in Buenos Aires, where he established a successful school of guitar. As a teacher and performer he inspired other guitar virtuosos, including Augustin Barrios and Miguel Llobet." "I am surprised that you don't know Manjon because of his importance to the guitar. He is the coolest ever. He was born in Jaen, Spain in 1866. He died in 1919 and lived in Buenos Aires most of his life. He was blind since he was 3. That is mind blowing because he was touring all the cities of europe by his early teens. He must have been so good! He was the guy that made Miguel Llobet wana play the guitar. His music isn't recorded a lot but there is one great cd that has 8 of his compositions. 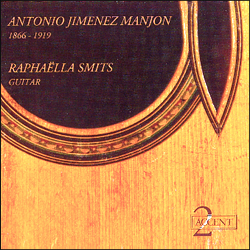 It's called Antinio Jimenez Manjon and the guitarist is Raphaella Smits. She is a great guitarist with lots of feeling. And I hate the comparison to his music being like Tarregas in most sheet music publications and cd's. His music is so much more grande and poetic. Basically he would blow Tarrega off the stage. OK, I hope you like Manjon." The Vicente Arias guitar of 1899 comes from the collection of Narciso Yepes in Madrid, Spain. It is probable that the instrument belonged first to the teacher of Yepes, Estanislao Marco (the latter posed with this guitar for the photo on page 386 of the book by Wolf Moser "Francisco Tarrega"). Vicente Arias made guitars around 1870. He lived and worked in Ciudad Real, and at the end of his career he had a workshop in Madrid. His instruments display a remarkable mastery, comparable to those of Antonio Torres and Manuel Ramirez. Specialist makers acknowledge Arias for his innovations. Some famous guitarists like Francisco Tarrega played the guitars of Vicente Arias. According to an up-to-date census, there are 24 guitars by Vicente Arias in existence. "Smits plays Antonio Jimenez Manjon with more heart than anybody should be allowed to have. She has the technique, to be sure, but her musicality sublimates everything, as the rubato pushes and pulls the tempo, and the melody just seems to float from her fingertips. This is one of the best guitar discs I've heard in a very long time." "More simple music than the 'Romanze #3' of Manjon is hard to find. To open a cd with this piece, and to cach immeadiately the melancholy in a convincing manner, gives testimony of great performers talent." "C’est ainsi que l’inspirée Raphaella Smits ressuscite avec magie les pages oubliées et pourtant si nobles de Antonio Jimenez Manjón, leur conférant un souffle à la hauteur des grands, dans une extrême pureté et évidence du geste musical. N’oublions pas que Segovia et Bream ont d’abord révélé un répertoire de valeur. Cette femme de talent continue leur grande œuvre." "Your initiative in choosing this repertoire was most original and is the kind which more musicians should take over, especially internationally renowned virtuosos like you. Also, in playing Manjon in such skillfull manner, the use of a masterpiece as the Vicente Arias guitar could only add finer taste. For all this, your Manjon record stands on top of my guitar records collection." "You really capture the spirit of Manjon's music." "The instrument by Vicente Arias, whose argent, ethereal treble that moves downward through beautifully voiced complexions to a bass range of such warmth and lucidity that its sound alone is transfixing." "Whow, what an impressive playing on such a unique instrument with 'piano-like' profound basses. Just great!" "L'enregistrement de Manjon est un disque de qualité à se procurer pour y retrouver sa sensibilité. Raphaella Smits est, à mes yeux, la plus grande guitariste classique au monde. Ses interprétations sont divines. Sensible, précise, elle a la clé pour vous évader totalement du monde environnant."